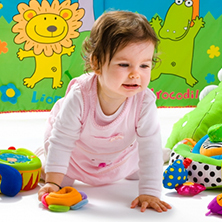 Infant Daycare: Is It A Good Thing or a Bad Thing For Kids? 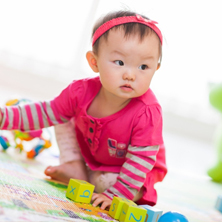 Does Infant Care and Daycare Start Too Early? When it comes to your child, you want the best for them. But is it too early to put your child in infant care? It’s a legitimate question to ask, considering the welfare of your child is at stake. 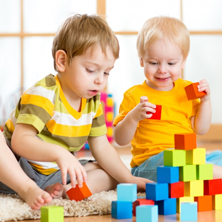 Most daycare centers will take infants as young as six weeks, and the question arises: are children entering daycare too early? The question as to whether or not you should bring your child for infant care might be moot. You might not have any choice when it comes to putting your child in daycare if you absolutely must work to support the family. We respect and understand that, and we’re very happy to make the best of the situation by caring for your child each and every day. No matter what, we hope you choose a Christian daycare facility so that your child is always surrounded by Jesus-centered caring. When children are attending our Christian infant care, they’re always being reassured how much God loves them. There is lots of holding and hugging in our infant care, and the children are constantly told that they are loved by their parents, the workers, and Jesus. But What About The Sniffles? While we maintain a very clean environment around here, there’s the chance that children might come home with an extra cold or two. And as hard as that can be for parents to accept, there’s no doubt that it’s actually a good thing. Kids who get a little bit sicker when they’re younger actually have stronger immune systems later in life. A little discomfort now can prevent a lot of discomfort later. There is one advantage when it comes to nannies, and that is that your child will get one-on-one attention. That attention is split the more children you have, of course, but the nanny tends to have one purpose: the kids and the kids alone. However, a nanny is only one person, which means that on a typical day the child or children are only interacting with only one adult and their siblings. When kids head to a daycare center, they’re at least interacting with multiple adults and many other children and improving their social skills. That’s the most frustrating part! In a billion-dollar industry that affects a full 16% of American children, there’s very little hard evidence about whether it’s good or bad for kids. There is evidence that it helps children with the cognitive development, but that kids in daycare might end up being more aggressive. Of course, this aggressiveness can be tempered at a Christian daycare like ours. In the end, every family has to decide if it’s right for them for their infant to attend daycare. If it is, then we’d like to suggest Christian daycare for the child to ensure that they get daily doses of Jesus!